Hi peeps! 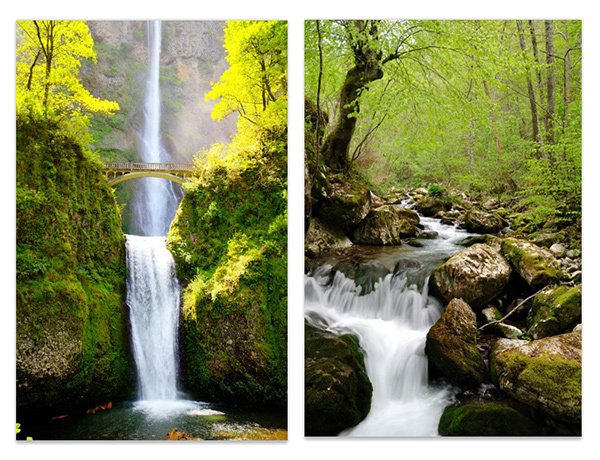 Have you ever visited a waterfall and wished you could just bring it home with you? Now you can! 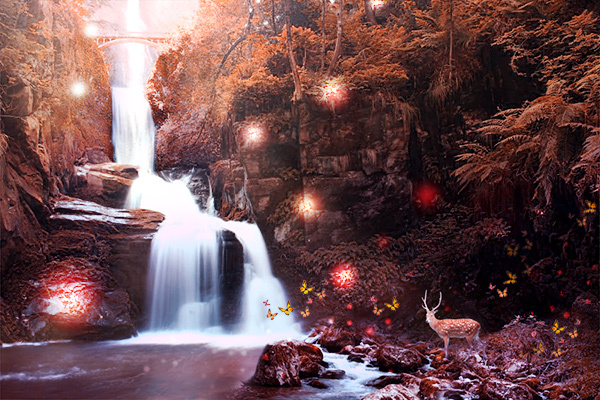 With Photoshop, you can reignite this beautiful waterfall scene and turn it into something enchanting. 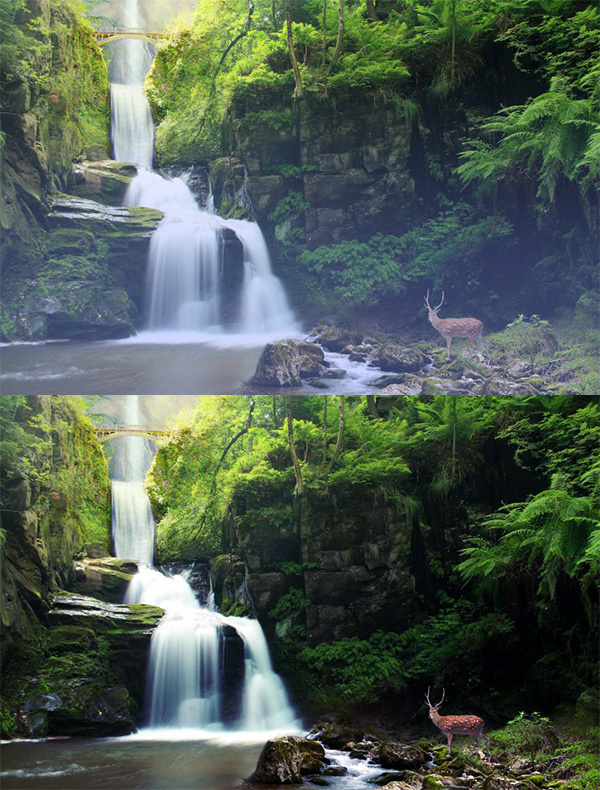 Learn how to create this picture using a variety of Blend Modes and Adjustment Layers. So let’s get started! Open all your images into Photoshop. We will use the main landscape image as the base of our forest to apply the other pictures. 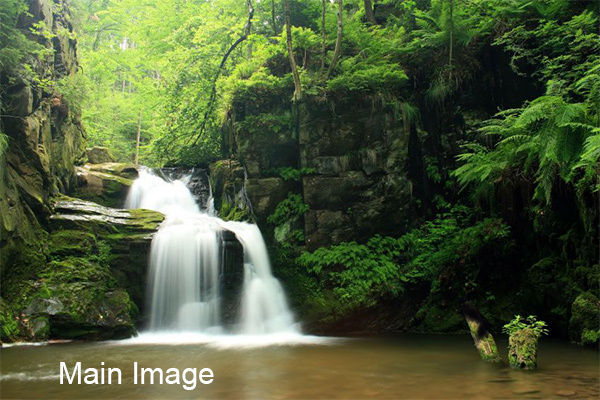 For now, flip the images of the waterfall and stream between stones by going to Image > Image Rotation > Flip Canvas Horizontal. Copy and paste both images onto the main landscape. Control-T to Free Transform, adjusting their sizes so that they fit better into place. Then use the Eraser Tool (E) to erase away the bottom of the waterfall, and the top of the stones. 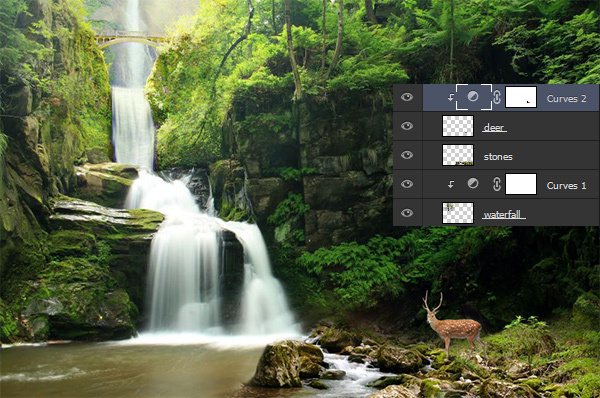 Use the Polygonal Lasso Tool (L) to make a selection around the waterfall. Go to Filter > Blur > Motion Blur and add a 90 degree blur set to 30 pixels. This will make the water appear silky and blend it into the stream below. 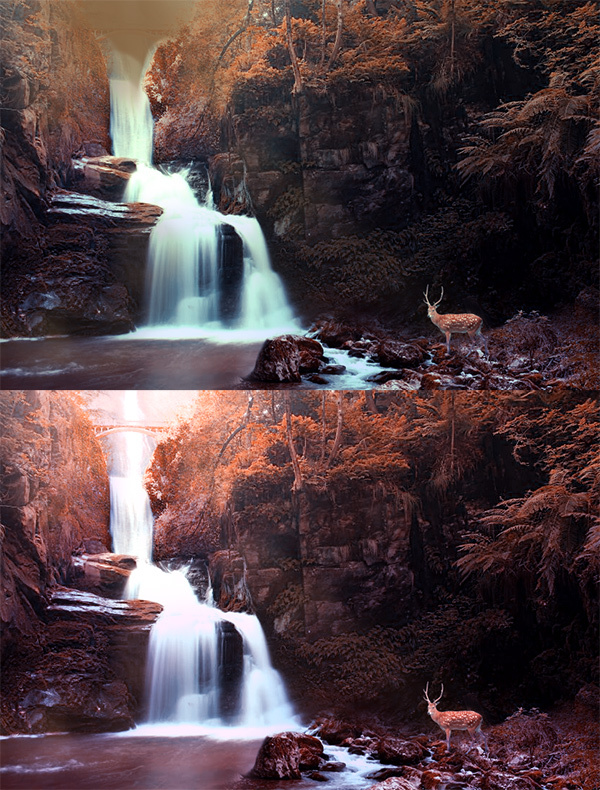 Open the deer into Photoshop. Use the Magic Wand (W) to select the white background. Hit delete to remove it then Copy and Paste the deer onto the stones in the lower right corner. 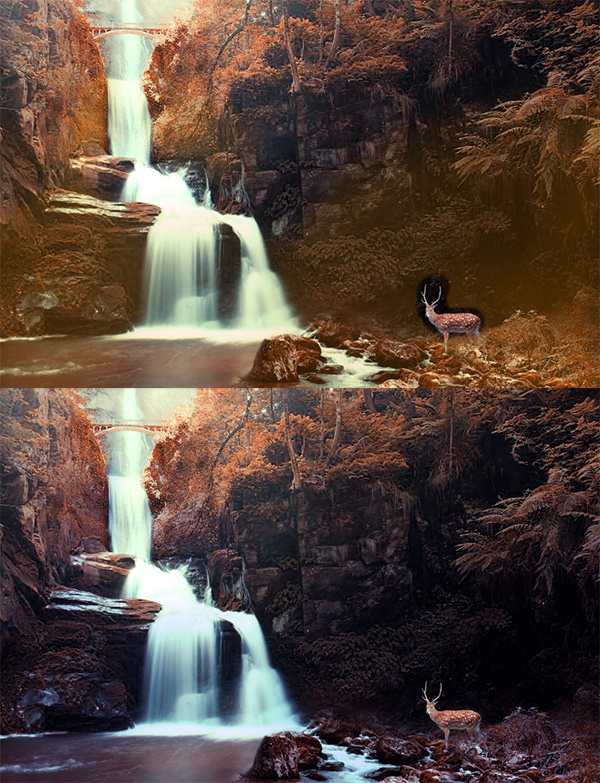 Set two new adjustment layers of Curves as Clipping Masks to the deer and waterfall. Adjust their RGB Channels so that the lighting reflects the main image. On a new layer, use the Gradient Tool (G) to create a light blue (#8296e7) linear gradient at 30% Opacity and set it to Color Burn. For a more dramatic color scheme let’s change the colors with a new Channel Mixer Adjustment Layer. Select the Green Output Channel, and make the following adjustments: Red +20, Green +14, and Blue +87, and Constant -2. Continue to tweak the colors until you’re happy with it. First, add a new layer and use the Brush Tool (B) to paint a soft orange color towards the bottom of the landscape. Set this layer to Subtract. 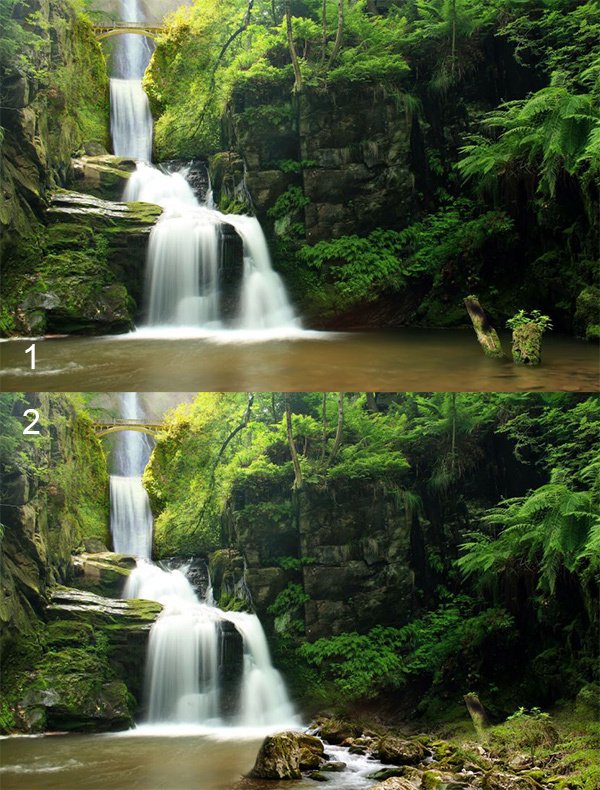 To add light coming in from the waterfall, paint a dark brown color and set the new layer to Screen. 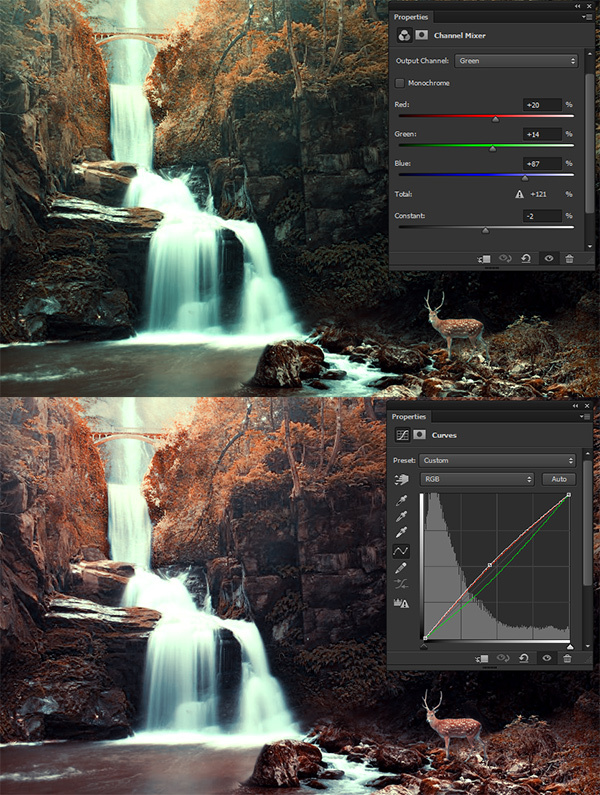 Then add a new Color Balance Adjustment Layer with the following settings. For Midtones: Red+4, Green -10, and Blue -20. And for Highlights: Red +12, Green -16, and Blue +16. To add more magic to this forest, we’ll add a couple of butterflies and bright spots of light. First, merge all the layers together. On a new layer set to Vivid Light, use the Brush Tool (B) to create bright tan spots all over the image. Vary the size and placement to make it appear more magical. Right-click to duplicate this layer for a more intense lighting effect. Copy and paste some images of butterflies onto the landscape and adjust their sizes so that they’re all small. Have them surround the deer for a playful interaction. To finish off the forest, let’s add a little more brightness and warmth. Set a new layer to Overlay, and use the Brush Tool (B) to paint white and soft warm colors all over the landscape. Add more butterflies to fill up empty spaces, and make them pop out with intense lighting. Once you’re finished your image should look like this! 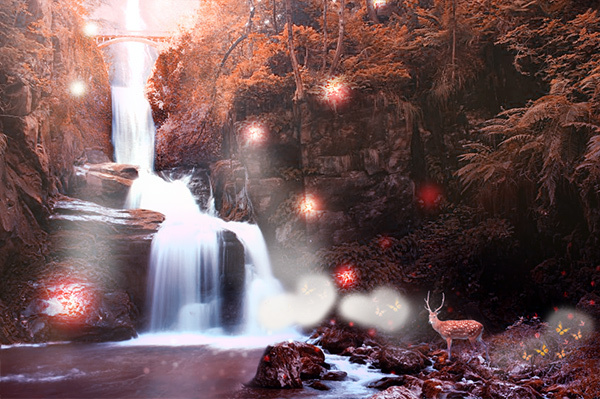 You too can create a beautiful magical forest by blending stock images together. Have fun creating your own and feel free to show us your results!